Beautiful engraved RARE specimen certificate from the Netscape Communications Corporation printed in 1997. 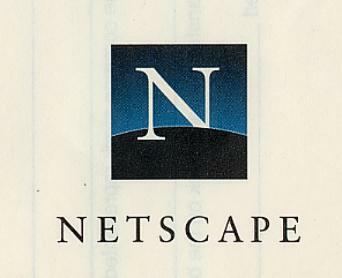 This historic document was printed by the American Banknote Company and has an ornate border around it with a vignette of the famous Netscape logo. This item has the printed signatures of the company's officers including Jim Barksdale as President and CEO. 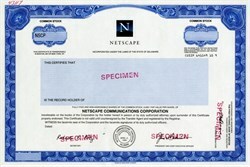 This is only the second time we have had a Netscape Specimen certificate for sale. Jim Barksdale served as President & CEO of Netscape Communications Corp. from January 1995 until the company merged with America Online in March of 1999. He was a Director of Netscape from October 1994. Upon completion of the merger with America Online, Jim joined AOL's Board of Directors.